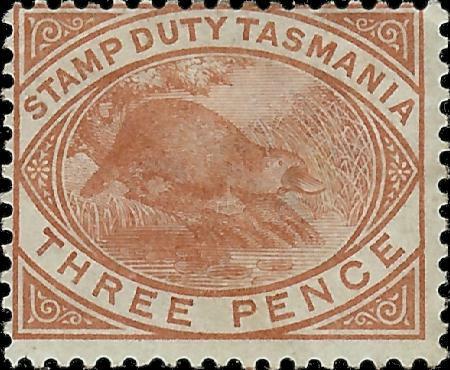 The debut of the platypus on an Australian stamp took place in 1880, when it was depicted on a new series of Tasmanian fiscal stamps. The series, of four denominations, was originally intended for normal stamp duty purposes but in 1882 was authorized for use for the prepayment of postal charges. The stamps therefore attained a postal status but, notwithstanding, are not listed in all standard postage stamp catalogues. When listed, they are described under the heading of "Postal Fiscals". The denominations and colors of the four stamps were as follows :- 1d. slate, 3d. pale brown, 6d. lilac and 1s. carmine. However, some shade variations occurred. The stamps were letterpress-printed, on paper watermarked "TAS", by Messrs. De La Rue and Co., London, a firm which had printed many other stamps for the Tasmanian government, and perforations gauged 14. Late in 1900, the 3d. stamp of this series, and also 1d., 2d., 6d. and 1/- stamps of the same design type, but locally printed by lithography, and perforated 12, were over-printed "REVENUE" in black, thus cancelling the postal validity which the original denominations of the series had acquired 18 years earlier. This group exhibits considerable shade variations, particularly when compared with stamps of the original printings. The additional 2d. stamp in the series was chestnut in color. It would not appear that it had been earlier valid for postage purposes although possibly it may have been so used. After application of the "REVENUE" overprint the stamps ceased to have postal status but some may have been used on mail matter or postmarked to order. There is no evidence that such usage was ever authorized and in any case such stamps would not have had postal validity in 1901, when Federation took place. At this time, postage stamps bearing States' names continued in use as Commonwealth stamps but it was a requirement that these separate series be valid only for postage purposes.